Community forestry in Nepal is considered an exemplary forest management regime. However, the economics behind managing a community forest is not fully studied. This study examines whether the benefits generated from community forest management justify the contributions of forest users. The study is based on a survey of community forest users in Chitwan, Nepal. A household level benefit-cost analysis was performed to quantify and compare the costs and benefits from community forest management. Only direct benefits were included in the analysis. The study shows that older forest user groups derive more benefits to households compared to more recently established ones. The extent of timber harvesting also substantially influences the size of the household benefits. In addition, redistribution of benefits at the household level, in terms of income generating activities and payment for involvement in forest management activities, also enhances household benefits. Sensitivity analysis suggests that the current practice of community forest management enhances the welfare of rural households in this subsistence community. However, this finding is sensitive to assumptions regarding the opportunity cost of time. The study also found that the household costs of community forest management depend upon two factors – the area of community forest and the size of the forest area relative to the number of households. The households’ dependency on forest resources in developing countries has motivated policy-makers to decentralize the forest management approach, thereby leading to the evolution of community forestry (CF) as a dominant forest management strategy. In the context of forest degradation and deforestation in developing countries, the CF has gained a considerable attention in the international forest policy discussions. This is mainly due to its contribution to the improvement of environmental conditions in degraded areas and to the enhancement of the livelihoods of forest dependent communities (Baland and Platteau 1999; Shrestha et al. 2010; Pandit and Bevilacqua 2011). However, the CF has not always achieved the intended outcomes (Tole 2010). For example, Kellert et al. (2000) suggest that whatever has been achieved so far on the socio-economic side through CF intervention has been at the expense of conservation goals. This trade-off between the economic and conservation goals in CF management may be the consequence of a desire to encourage forest users to participate in forest management activities. In general, most of the forests handed over to communities are natural forests which may require less effort in order to achieve welfare gains compared to the effort required to achieve welfare gains from alternate forms of social mobilization. People’s participation is much emphasized in community-based programs as it is believed to be a foundation for such programs to be considered as successful. CF programs are not exception. Empirical studies suggest the success of the CF programs also relies on the level of participation of forest users throughout the CF process so that they have a feeling of ownership on every decision and action taken with regards to CF management. The perceived benefits of access to financial resources, community development, and forest improvements change people’s behavior and attitudes toward, and understanding of CF programs and this leads to increased participation (Dongol et al. 2002). Therefore, in principle, all members of the community participate in forest management activities equally and receive benefits generated from these activities. However, the empirical evidence shows that the level of participation in CF activities is determined by the socio-economic characteristics of forest users and the benefits obtained from the forest resources they are managing (Maskey et al. 2006). Ultimately it is the households who act as economic agents in deciding whether they participate in CF activities and they do so by assessing the opportunity cost of their participation (Maskey et al. 2006). They evaluate the benefits generated from participation over per unit costs of other alternatives available. Ironically, existing studies of household benefits from CF management have often ignored the costs in terms of households’ contribution. The limited information on costs and benefits may result in the continuation of inefficient resource allocation in CF management (Nowak and Dwyer 2007). Any programs designed and based on such incomplete information may lead to injustice to the rural poor, the real target of the CF program. Nevertheless, participants are encouraged to contribute to forest management on the assumption that their welfare will be enhanced through participation. In this context, the primary question this study attempts to answer is – do the benefits generated to individual households from the CF management justify the contribution of forest users? This study may provide a policy feed-back to the Government of Nepal since the Ministry of Forest and Soil Conservation (MFSC), Nepal has designed the forestry sector’s goal as forestry for prosperity. In addition, the benefits received by a forest user may be influenced by the performance of an individual community forest user group (CFUG). The performance of any institution/group may depend upon its experience and age (Schmidt et al. 1986). With age and experience, the forest management strategies vary from one CFUG to another (Pokharel 2012). Therefore, the lessons learnt from the older CFUGs might be instrumental towards enhancing the efficiency of the newly formed CFUGs as well as the CFUGs to be formed in the future. Based on this observation, the second aim of this study is to address the question of whether the members of older CFUGs receive more benefits than those of more recently established CFUGs. where, N is the total number of years, t is the year of the cash flow, i is the discount rate, and R is the net cash flow (either benefits or costs). The PV of economic costs and benefits of CF management were calculated with a 10% discount rate (opportunity cost of capital approach) for a five year time horizon. The benefit-cost ratio (BCR), which is the ratio of the PV of benefits to PV of costs, was computed. The BCR higher than one indicates that the benefits generated to households from CF management outweighs the costs borne by households. A sensitivity analysis was carried out under the three different scenarios. The first scenario is the estimated BCR (BCR-I) based on the computed cost of CFOP implementation (Cost-I) using the opportunity cost of the time spent by a household in forest management activities. This is because the opportunity cost of time may vary across the individuals within society. In this analysis the opportunity cost is assumed to be 47% of the market wage rate based on the estimates of Rai and Scarborough (2013, 2015). The second scenario (BCR-II) assumes all users can harvest timber as per their demand (need). The third scenario (BCR-III) is that all users can harvest both timber and fuelwood as per their demand (need). The estimations of BCR-II and BCR-III are based on the contributed time computed using the market price. In this analysis, five different costs were taken onto consideration. First is the forest management cost which covered the costs of silvicultural and forest protection activities including thinning, cleaning, pruning, patrolling, and fire line development. Second type of cost is the forest products collection costs that pay to the CFUG to get access to timber, fuelwood, and other products (e.g. fodder, sal leaf, and grass). The time spent in collection was also considered as the collection costs. Third type of cost is the transaction costs, which include the costs of operational plan preparation, attending a meeting, capacity building and annual membership fee. These costs arise during the course of development and implementation of the community forest operational plan when forest users exercise their exclusive rights over common property resources (Adhikari and Lovett 2006). The inclusion of transaction costs into policy formulation is necessary to determine the failure and success of community forest management (Meshack et al. 2006). Hence, this study attempts to analyse the transaction costs separately. Since the tenure right of the community forest is with the Government of Nepal and the users are not entitled to pay the rent for the forest land, the land rental cost is not included in the analysis. Fourth is the material costs that we used in this study. Forest users use various harvesting tools and means of transport. The material costs included costs of tools’ purchase and maintenance and transport. The last but not least is the annual membership fee that a member household has to pay. The costs of households’ contributions are estimated either in monetary terms, if they are paid in cash, (e.g. annual membership fees) or in time when the contribution is in terms of labour, for example, participation in forest management activities (thinning, pruning) and meetings (user group assembly and user committee meetings). Both travel cost (time to reach the program venue from participants’ houses) and actual time spent for participation in the particular activities are included in the estimation. The benefits of forest management for individual households are multifaceted. The goods and services supplied by the forest ecosystem range from direct use to indirect use (Costanza et al. 1997). However, this study mainly focuses on provisioning services directly used by forest users, as forest users manage their forests particularly for forest products to maintain their livelihoods. They also receive benefits from participating in CFUG activities such as meeting allowances. A limitation of this study is that it may not capture the non-market benefits generated from CF management. These benefits could include an increase sense of well-being associated with community involvement. In this study benefits are divided into four categories: forest management, forest products, CFUG support and benefits from other activities. Forest management benefits were the benefits received by a user after participating in forest management activities. Forest products benefits were the values of the collected products estimated with the current market price. In case of non-traded products, the ‘value of time’ was taken into consideration. The CFUG support is the amount received by a user from the CFUG for income generating activities and the forest products supplied free of charge for ritual functions. Benefits from other activities are the allowances received for participating in the meetings or the training workshops. The price of non-marketed forest products is difficult to estimate. In this study, the value of such is based on the time spent to collect the products. The value of time was estimated under two scenarios: (i) the market wage rate and (ii) the opportunity cost of time. During the study period, the daily wage rate was – NRs. 3501. The forest in Chitwan district is dominated by Sal (Shorea robusta), which is an economically valuable species. Community forests (CFs) meeting two criteria i.e. having Shorea robusta dominance and geographic (altitude and aspects) similarities were the population for this study. Out of 58 CFUGs, only 23 CFUGs in the district have met these criteria since the second criterion was the main constraint. These 23 CFUGs were further clustered into four groups based on the year of hand over. Two CFUGs from each cluster (eight in total) were randomly selected for the household questionnaire survey (Table 1). The purpose of clustering was to capture the effects of experience on the efficiency of CFUG management. Description of the sample CFUGs. (Source: District forest office, Chitwan). The CFUGs equal to/less than five years old fall under the cluster-I (≤5 years). CFUGs in this cluster have not revised any CFOP. Cluster-II has CFUGs between five and ten years with revised CFOP once. Similarly, cluster-III includes CFUGs between ten and fifteen years with revised CFOPs twice. CFUGs in cluster-IV are above fifteen years with revised CFOPs thrice or more. The households associated with the eight CFUGs were the population for this questionnaire survey, out of which 600 respondents were chosen. From each CFUG 75 households were selected. Table 5 reports the socio-economic characteristics of the sampled households. Two sampling techniques were applied while selecting the respondents for this survey. Firstly, the users of each CFUG were stratified based on the home-to-forest distance as <1 km, 1–2 km and >2 km (Rai and Scarborough 2013). In community forests, distance decay effects exist due to households’ dependency on forest products (Sapkota and Odén 2008). This means households close to the forest generally have higher reliance on the forest compared to more distant households. Secondly, after stratification, the first respondent was randomly selected and the rest followed the systematic sampling technique (i.e. every 10th household). A total of 600 households (8 CFUGs ×3 strata ×25 households from each stratum) from the eight CFUGs were interviewed. Detailed information on the costs borne and benefits derived from the forest by individual households and relevant socio-economic data were collected using a structured questionnaire, which was prepared after intensive consultations with members of CFUGs, district forest office staff and the community forestry experts working in the study area. Before conducting the questionnaire survey, pre-testing of the questionnaire was done through a pilot survey in a CFUG in the study area through face-to-face interview with the heads of the selected households. A few modifications were made following the pre-testing. The following key assumptions were made for this study while estimating households’ benefits and costs. Since the forest-dependent communities have a short time-horizon, only direct use values were used in this analysis. Only the forest products harvested by the local forest users were considered. In the estimation, we have assumed the costs and benefits of the community forest operational plan implementation to be constant throughout the implementation period. The monetary value of time contributed was estimated using the market wage rate i.e. NRs 350/day. Revenue generated from the sale of forest products, membership fees and forest products collection fees are redistributed to forest users for income generating activities, and wages for timber harvest to sell outside the CFUG. But, the intangible benefits from community development activities were not included in this analysis. Since, Sal (Shorea robusta) forest is the most valuable forest, the benefits estimated in this analysis is the maximum that any Nepalese CFUG can generate in the present CF management model. Capacity building is not just costs but benefits too because it helps participants develop skills which they can apply in income generation and self-employment activities and they can invest the income generated from such activities for their family’s well-being such as educating children, curing for health and purchasing food stuffs etc. However, it is really difficult to quantify the exact benefits generated given the multiplier effects of capacity building programs and therefore these benefits were excluded in this study. Of the total, 54% of respondents were male and 46% were female (Table 2). Agriculture was the main source of income and 73% of total respondents had farm income as a major household income source. The mean age of participants was 41.83 years and the average family size was 5.87 people. Descriptive statistics of sample CFUGs. Age, education and family size are average values with standard deviation in the parentheses. The statistics of rest of the variables are in number of households. Forest users collect different types of forest products from their respective community forests (Table 3). Timber, firewood and forage are the main forest products. Timber is the main commercial forest product as all surveyed CFUGs have high value species, such as Shorea robusta. The majority of users (94%) collect fuelwood from their community forests while 74% and 60% of the users collect grass and fodder respectively and a small number of forest users (15%) collect timber annually from their respective community forests. The small number of timber users is mainly due to the temporary ban on green tree felling without permission imposed by the District Forest Office, Chitwan. However, older CFUGs harvest more timber than younger CFUGs (Pearson correlation r=0.67 at 5% level). Parewashori CFUG of Cluster-IV is the highest collector in terms of the volume of forest products. This user group distributes timber to its members as per need and more than a half (53%) of these forest users harvest timber. Nibuwatar CFUG of Cluster-II has no timber harvesting but all users of this group collect fuelwood from the CF. Three CFUGs (Janakalyan, Debidhunga and Chelibeti) distribute timber to a limited number of households but only in emergencies. Table 4 reports the average household costs of CF management borne by forest users. On average, forest products collection costs constitute 91% of the total costs with a range of between 76 and 96%. On average, CF operational plan preparation cost contributes 3.82% of the total cost, while in Parewashori CFUG, which has the largest forest area, the operational plan cost covers one-sixth of the total cost. Transaction costs are only 2% of the total cost, which is slightly less than forest management costs. In the CFUG having the highest operational plan preparation costs, transaction costs are also comparatively higher. Description of annual household costs of forest management (in NRs). Figure in the parenthesis indicates percentage of total household costs. We also calculated the CF management costs excluding operational plan preparation costs. This computation shows that from the second year of the plan implementation, when all costs are constant, the share of forest products collection cost increases up to 95% on average. This calculation shows that costs of CF management per household depend upon two factors; the area of community forest and the proportion of forest area to the number of households. Forest users derive benefits from different sources (Table 5). All CFUGs distribute forest products to their members, which is the foremost source of benefits constituting 97% of the total estimated benefits from CF. The Pearson correlation test shows that there is a high correlation between the years of establishment of the CFUG and the benefits per households (r=0.60 at 5% significant level) indicating that forest users of older CFUGs receive more benefits compared to their counterparts of more recently established CFUGs. Annual household benefits from CF management in NRs. Figure in the parenthesis indicates percentage. The results also reveal that the size of the benefits from CF depend upon the quantity of wood harvested and the number of households collecting wood. The market price of the timber collected by local people contributes 43% of the total benefits from forest products. In Parewashori CFUG, there is a provision of providing timber depending on each household’s need; and as a result users of this CFUG derive maximum benefits. In Nibuwatar CFUG, no timber was harvested in the previous year. Hence, users of this CFUG received the least benefits. Nibuwatar and Janakalyan CFUGs do not support their poorer members for income generating activities. Benefits sharing mechanisms in sample CFUGs are not identical. For instance, Parewashori CFUG provides timber for its members as per their needs, while Nibuwatar CFUG has no such provision. Three CFUGs namely Janakalyan, Debidhunga and Chelibeti provide timber only to limited number of users based on their needs. Janakalyan, Nibuwatar, Shivapuri and Parewashori CFUGs have provision of payment for participating in forest management activities including thinning, pruning and fire line construction while all sampled CFUGs except Janakalyan and Nibuwatar distribute benefits to their poor members for their income generation and provides allowances for participating in CFUG meetings (Table 5). The estimated benefit cost ratios (BCRs) suggest that the older CFUGs have higher ratios compared to the more recently established CFUGs (Figure 1). 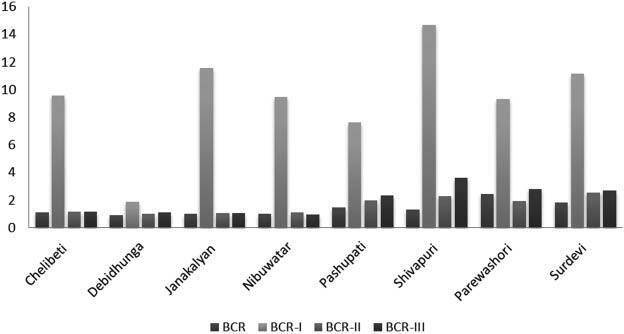 In this analysis, Parewashori CUFG (Cluster-IV) has the highest BCR followed by Surdevi and Pashupati Kailashpuri CFUGs. This is mainly due to the volume of timber harvested. On the other hand, two CFUGs – Nibuwatar (Cluster-II), and Debidhunga (Cluster-I) – which have no, or very negligible, amounts of timber harvested have BCRs of less than one. Pearson’s correlation test indicates that CFUGs which have been established for longer have a higher BCR for the household members of the CFUG than more recently established CFUGs (r=0.76 at 5% significant level). Benefit-cost ratio under different scenarios. The results of sensitivity analysis are reported in Figure 1. The BCR-I indicates that the BCR increases substantially in all CFUGs, however the rate of change varies across the CFUGs. This result suggests that in rural areas, where there is underemployment and all labor is not fully employed, community forest management may be financially efficient. However, if the economy is experiencing full employment and a market wage is more appropriate for valuing the labor contribution of households, only CFUGs in Cluster-III and Cluster-IV indicate a higher BCR. All CFUGs have BCRs higher than one under the second scenario, which suggests that by increasing timber supply makes CF management financially efficient even when the opportunity cost of time for labor is fully accounted for. The BCR-III estimates show that Nibuwatar CFUG has a BCR less than one, mainly due to the higher collection costs of fuelwood compared to its benefits. The results of financial benefit-cost analysis at the household level indicate that CF management in developing countries is economically efficient in the present socioeconomic context. The results also reveal that the BCR increases with the length of establishment of the CFUG. It implies that members of older CFUGs have higher returns on their contribution compared to the members of more recently established CFUGs. There might be two reasons behind these results. Firstly, older CFUGs tend to adopt more rigid regimes to CF management, which may improve the forest conditions relative to more flexible regimes in more recently established CFUGs (Pokharel 2012). Secondly, older CFUGs harvest large quantities of harvestable timber and the amount of timber harvested is directly linked with the household benefits. In general, older CFUGs have faced both first generation (ecological restoration) and second generation (livelihoods, forest governance and sustainable forest management) issues which have emerged with the development of CF programs (Hansen 2007). Their experience may have made them more competitive and able to generate more benefits for their users. In rural areas of Nepal, fuelwood is the main forest product collected for cooking and heating (Baland et al. 2010). The results of this study also support previous studies indicating that the majority of forest users rely on community forests for fuelwood. Although timber shares a large portion of benefits compared to other forest products, its contribution to rural livelihoods is limited as only one fifth of the total respondents enjoyed the benefits of timber. In addition, there is risk and uncertainty associated with timber harvesting in Nepal because harvesting green trees is legally banned by Nepal’s forest policy. However, if the welfare of forest users is to be enhanced from CF management, there should not be any restriction on timber harvesting as prescribed by CFOP. The results of sensitivity analysis using the shadow value of time reflects that CF management could substantially contribute to social welfare if users actively participated in the implementation of CF operational plans and the CFUGs redistributed benefits to their users as a compensation for their involvement in forestry activities. In general, rural farmers in developing countries are considered underemployed as they are jobless during slack seasons (Ahmed 1978), and CF activities including thinning, pruning, and singling are mostly undertaken during the slack season. Paying forest users for participating in forestry activities contributes to enhancing their welfare and creating employment during the off-season. This is the case in Nibuwatar CFUG, where forest users are paid for their forestry activities. On the other hand, the analysis under the assumption of labor wages based on the prevailing wage rate indicates that CF management is not profitable for individual households indicating that the opportunity cost of implementing CFOPs is very high for communities. In general, farmers practicing subsistence farming in Nepal are underemployed most of the year (Khadka 1998). Therefore, in the short-run CF management can contribute to poverty reduction. In the long-run, as the rural economy improves, CF management may shift towards timber production. In this context, CFUGs can generate more benefits, such as income from carbon trading including carbon sequestration and reduction of emission from deforestation and degradation. The results also show the role of active forest management in benefiting forest users. For instance, in Scenario-II and Scenario-III, which are the active forest management cases, focus on the production of timber and fuelwood improves community outcomes. The estimated BCR-II and BCR-III indicate that CFOP implementation can be financially efficient for households at full employment when forests can fulfil the demand for forest products of all households. This shows the welfare of forest users can be enhanced by promoting forest management in CF programs (Kellert et al. 2000). Our analysis of households’ benefits and costs of CF management indicates that CF programs are economically beneficial for participating households. Benefits would further increase if District Forest Office did not impose restriction to implement CFOP. In addition, if environmental services were taken into consideration as benefits, it is likely that the benefits from/to the community forest would be greater than those identified in this study. The results also suggest that active forest management can enhance the benefits of CF management, which can be financially attractive to the households even when labor contributions are fully costed. The results indicate that the age of CFUGs determines their performance in terms of generating benefits per unit household. Therefore, regular networking meetings of CFUGs would be better to enhance the performance of newly established CFUGs. In addition, the volume of timber is positively associated with the BCR and older CFUGs harvest more timber compared to more recently established CFUG. This suggests the need for both short-run and long-run strategies for forest management. In the short-run, CF management should give emphasis on producing firewood while retaining trees to produce timber in the long run. In addition, the benefits generated by CFUGs also contribute to the macro economy as user groups are supporting poorer members by generating income producing activities and poverty reduction is a national priority. A further study assessing the distributional issues of CF management would be interesting to make the CF program more efficient and equitable. This study is limited to the assessment of costs and benefits flows at the household level. There are other costs and benefits which are not included in this analysis. For instance, costs and benefits associated with timber sales outside the group and contribution of CFUGs in community development activities. This requires further analysis. However, this study undoubtedly opens the door for further research regarding which groups (who) bear the costs and which groups (who) enjoy the benefits of CF management. 5Nepalese currency (NRS), USD1 ~NRs 100. The authors would like to express their sincere thanks to Institute for World Forestry Johann Heinrich von Thuenen-Institute (vTI), Germany for the financial support to conduct this study. We would like to thank District Forest Office, Chitwan team for their support during data collection. Adhikari, B and Lovett, J. C (2006). Transaction Costs and Community-Based Natural Resource Management in Nepal. Journal of Environmental Management 78(1): 5–15. Ahmed, I (1978). Unemployment and Underemployment in Bangladesh Agriculture. World Development 6(11–12): 1281–1296. Baland, J.-M and Platteau, J.-P (1999). The Ambiguous Impact of Inequality on Local Resource Management. World Development 27(5): 773–788. Baland, J.-M, Bardhan, P, Das, S, Mookherjee, D and Sarkar, R (2010). The Environmental Impact of Poverty: Evidence from Firewood Collection in Rural Nepal. Economic Development and Cultural Change 59(1): 23–61. Costanza, R, d’Arge, R, de Groot, R, Farberk, S, Grasso, M, Hannon, B, Limburg, K, Naeem, S, O’Neill, R. V and Paruelo, J (1997). The Value of the World’s Ecosystem Services and Natural Capital. Nature 387: 253. Dongol, C. M, Hughey, K. F. D and Bigsby, H. R (2002). Capital Formation and Sustainable Community Forestry in Nepal. Mountain Research and Development 22(1): 70–77. Hansen, P. L (2007). Second Generation Community Forestry -A study of the pro-poor focus in community forestry in Nepal. MSc, Institute for Society & Globalisation, Roskilde University. Kellert, S. R, Mehta, J. N, Ebbin, S. A and Lichtenfeld, L. L (2000). Community Natural Resource Management: Promise, Rhetoric, and Reality. Society & Natural Resources 13(8): 705–715. Khadka, N (1998). Challenges to Developing the Economy of Nepal. Contemporary South Asia 7(2): 147–165. Maskey, V, Gebremedhin, T. G and Dalton, T. J (2006). Social and Cultural Determinants of Collective Management of Community Forest in Nepal.. Journal of forest economics 11(4): 261–274. Meshack, C. K, Ahdikari, B, Doggart, N and Lovett, J. C (2006). Transaction Costs of Community-Based Forest Management: Empirical Evidence from Tanzania.. African Journal of Ecology 44(4): 468–477. Nowak, D. J and Dwyer, J. F (2007). Understanding the Benefits and Costs of Urban Forest Ecosystems. Urban and Community Forestry in the Northeast. Kuser, J ed. New York: Springer Netherlands, pp. 25–46. Pandit, R and Bevilacqua, E (2011). Forest Users and Environmental Impacts of Community Forestry in the Hills of Nepal. Forest Policy and Economics 13(5): 345–352. Pokharel, R. K (2012). Factors Influencing the Management Regime of Nepal’s Community Forestry. Forest Policy and Economics 17: 13–17. Rai, R. K and Scarborough, H (2013). Economic Value of Mitigation of Plant Invaders in a Subsistence Economy: Incorporating Labour as a Mode of Payment. Environment and Development Economics 18(02): 225–244. Rai, R. K and Scarborough, H (2015). Nonmarket Valuation in Developing Countries: Incorporating Labour Contributions in Environmental Benefits. The Australian Journal of Agricultural and Resource Economics 59(4): 479–498. Sapkota, I. P and Odén, P. C (2008). Household Characteristics and Dependency on Community Forests in Terai of Nepal. International Journal of Social Forestry 1(2): 123–144. Schmidt, F. L, Hunter, J. E and Outerbridge, A. N (1986). Impact of Job Experience and Ability on Job Knowledge, Work Sample Performance, and Supervisory Ratings of Job Performance. Journal of Applied Psychology 71(3): 432–439. Shrestha, U. B, Shrestha, B. B and Shrestha, S (2010). Biodiversity Conservation in Community Forests of Nepal: Rhetoric and Reality. Inter J Biodiv Cons 2(5): 98–104. Tole, L (2010). Reforms from the Ground Up: A Review of Community-Based Forest Management in Tropical Developing Countries. Environmental Management 45: 1312–1331.